Any cathode-ray tube consists of five major parts: an envelope or container, an electron gun, a focusing system, a deflection system, and a display screen. Most people have seen a cathode-ray tube or pictures of one. The picture tube in a television set is perhaps the most familiar form of a cathode-ray tube. The outer shell that gives a picture tube its characteristic shape is called the envelope of a cathode-ray tube. The envelope is most commonly made of glass, although tubes of metal and ceramic can also be used for special purposes. 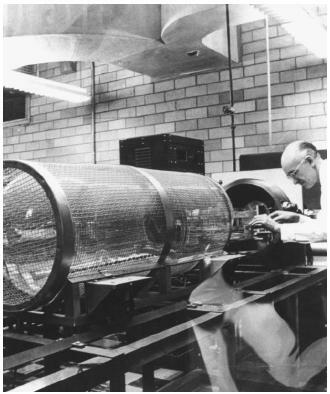 The glass cathode-ray tube consists of a cylindrical portion that holds the electron gun and the focusing and deflection systems. At the end of the cylindrical portion farthest from the electron gun, the tube widens out to form a conical shape. At the flat wide end of the cone is the display screen. Air is pumped out of the cathode-ray tube to produce a vacuum with a pressure in the range of 10 −2 to 10 −6 pascal (units of pressure), the exact value depending on the use to which the tube will be put. A vacuum is necessary to prevent electrons produced in the CRT from colliding with atoms and molecules within the tube. An electron gun consists of three major parts. The first is the cathode—a piece of metal which, when heated, gives off electrons. One of the most common cathodes in use is made of cesium metal, a member of the alkali family that loses electrons very easily. When a cesium cathode is heated to a temperature of about 1750°F (approximately 825°C), it begins to release a stream of electrons. These electrons are then accelerated by an anode (a positively charged electrode) placed a short distance away from the cathode. As the electrons are accelerated, they pass through a small hole in the anode into the center of the cathode-ray tube. The intensity of the electron beam entering the anode is controlled by a grid. The grid may consist of a cylindrical piece of metal to which a variable electrical charge can be applied. The amount of charge placed on the control grid determines the intensity of the electron beam that passes through it. lens shapes the flow of electrons that pass through it, just as a glass lens shapes the light rays passing through it. The electron beam in a cathode-ray tube also has to be moved back and forth so that it can strike any part of the display screen. In general, two kinds of systems are available for controlling the path of the electron beam: one uses electrical charges and the other uses a magnetic field. In either case, two deflection systems are needed: one to move the electron beam in a horizontal direction and the other to move it in a vertical direction. In a standard television tube, the electron beam completely scans the display screen about 25 times every second. An especially useful application of the cathode-ray tube is an oscilloscope. An oscilloscope measures changes in electrical voltage over time. The plates that deflect the electron beam in a vertical direction are attached to some source of voltage. (For example, they can be connected directly to an electric circuit.) The plates deflecting the electron beam in a horizontal direction are attached to some sort of a clock mechanism. Wired in this way, the oscilloscope shows the change in voltage in a circuit over time. This change shows up as a wavy line on a screen. As voltage increases, the line moves upward. As it decreases, the line moves downward. One application of the oscilloscope is troubleshooting an electric circuit. An observer can notice immediately if a problem has developed within a circuit. For example, circuits can be damaged if unusually large voltages develop very quickly. If a circuit is being monitored on an oscilloscope, such voltage surges can be detected immediately. Oscilloscopes also have medical applications. They can be connected to electrodes attached to a person's skin. The electrodes measure very small voltage changes in the person's body. Such changes can be an indication of the general health of the person's nervous system. The actual conversion of electrical energy to light energy takes place on the display screen when electrons strike a material known as a phosphor. A phosphor is a chemical that glows when exposed to electrical energy. A commonly used phosphor is the compound zinc sulfide. When pure zinc sulfide is struck by an electron beam, it gives off a greenish glow. The exact color given off by a phosphor also depends on the presence of small amounts of impurities. For example, zinc sulfide with silver metal as an impurity gives off a bluish glow, while zinc sulfide with copper metal as an impurity gives off a greenish glow. The selection of phosphors to be used in a cathode-ray tube is very important. Many different phosphors are known, and each has special characteristics. For example, the phosphor known as yttrium oxide gives off a red glow when struck by electrons, and yttrium silicate gives off a purplish-blue glow. The rate at which a phosphor responds to an electron beam is also of importance. In a color television set, for example, the glow produced by a phosphor has to last long enough, but not too long. Remember that the screen is being scanned 25 times every second. If the phosphor continues to glow too long, color will remain from the first scan when the second scan has begun, and the overall picture will become blurred. On the other hand, if the color from the first scan fades out before the second scan has begun, the screen will go blank briefly, making the picture flicker. Cathode-ray tubes differ in their details of construction depending on the use to which they will be put. In an oscilloscope, for example, the electron beam has to be able to move about on the screen very quickly and with high precision, although it needs to display only one color. Factors such as size and durability are also more important in an oscilloscope than they might be in a home television set. In a commercial television set, on the other hand, color is obviously an important factor. In such a set, a combination of three electron guns is needed—one for each of the primary colors used in making the color picture. This description is a genius of person in thought. Yes description here are very useful to me.I am noting to my notebook Thank You. the above description on cathode ray tube is very useful to understand the basic process and definition. very good, the above crt info is useful information..